Cincinnati and Vanderbilt will look to keep rolling but a Big 12 clash highlights Saturday’s slate. This game could really come down to which team imposes its will. For Missouri, it would love nothing more than to speed the game up, force turnovers and not let Baylor get set in its half court defense. Missouri’s strength is its guard play. Frank Haith employs a four-guard lineup and it has worked wonders this season. The Tigers have shot the ball very well this season and that’s going to have to continue on the road in Waco. Missouri has struggled against teams with bigger front lines so its guards must shoot well if penetration is cut off and Ricardo Ratliffe is limited inside by Baylor’s trees. Kim English, Michael Dixon and Marcus Denmon can flat out shoot the basketball and Haith will need all three contributing in order to beat Baylor. It will be a bonus if Ratliffe can get anything going inside but Mizzou’s guards must continue to make shots in a tough environment. Baylor is the stronger team inside and Scott Drew knows it. Getting Perry Jones III to assert himself in the paint along with Quincy Acy could be the key for the Bears in this game. Baylor will have the home crowd and energy behind itself and capitalizing on that is going to be very important against a team that loves to speed you up and force turnovers. 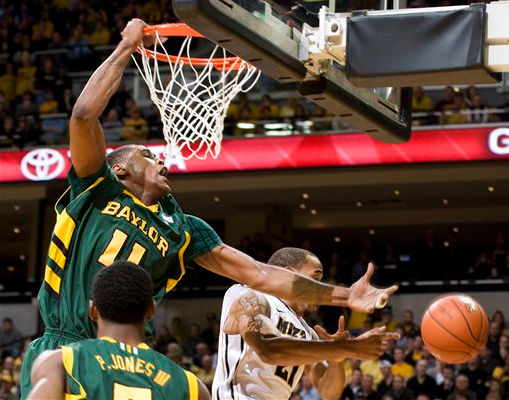 In order for Jones and Acy to get the ball, Baylor’s guard play must be up to the task. Missouri will pressure Pierre Jackson and A.J. Walton all game because the Tigers need to run up the turnovers and transition points in order to offset what should be a significant Baylor edge on the glass. If Baylor can slow the game down a bit, limit turnovers and get the ball inside, it should be on its way to a win. If Jones III and Acy are hot in the paint, that will open up Brady Heslip and Jackson from deep. Jackson does so much for this team with penetration, passing and shooting ability but Heslip is great spotting up or coming off a screen. Baylor has multiple weapons of varying height, something Missouri may have a very hard time dealing with. As we said, Missouri must speed the game up and create turnovers against the turnover-prone Bears. Ratliffe is a very good post player but we’re not sure if he’s going to be able to score consistently as the only Mizzou big man against Baylor’s immense height in the paint. If Missouri can’t get anything inside it must knock down deep shots and get to the free throw line. The Tigers shoot 77.6% from the charity stripe and that could end up being their most efficient way of scoring against Baylor aside from the three ball. Baylor didn’t defend well against Kansas but Missouri was exposed in a tough environment at Kansas State. If Baylor is physical and sticks to the game plan of good half court offense, the Bears should win. Missouri should play better in its second time on the road against a very good team but you have to favor Baylor at home given the size mismatch. ESPNU will debut the latest in the SEC “Storied” documentary series on February 11 with 40 Minutes of Hell. The film goes behind the scenes on former Arkansas coach Nolan Richardson‘s success with the Razorbacks in the early 1990s. The “40 minutes of hell” fast paced and pressing style that Richardson employed in the SEC won him the National Championship in 1994. Richardson’s separation from the university was anything but amicable as he slapped Arkansas with a wrongful termination lawsuit. The Razorbacks hired Richardson’s protege, Mike Anderson, as head coach helping to bring the former coach closer to fans, players, and the University of Arkansas. Not to mention, the hire also brought back a style of play that is modeled after Richardson’s championship winning system. Senior forward Lance Goulbourne has found his role on Vanderbilt’s roster, and he is making his impact felt on the defensive end. Goulbourne has limited the role of several prominent big men in recent games, holding Marquette’s Jae Crowder to 30.8% shooting and Auburn’s Kenny Gabriel (just to name a couple) to just 2 points on 1-7 shooting. “He’s done an unbelievable job about three games in a row where the team’s best player was the four man,” Vanderbilt guard Brad Tinsley said. “He’s really figured out how to take what the coaches tell him and put that out on the court.” With the return of center Festus Ezeli and solid defense from Jeffery Taylor, Goulbourne’s defense is an added plus for a team known more for its offense. The Commodores’ commitment to the defensive end has their defense ranked ahead of their offense in latest Pomeroy efficiency rankings. Kentucky coach John Calipari has a theory for why his Wildcats haven’t been effective on the road in the last couple of years. He says the SEC is not an easy league to compete in, and declares that the league could have as many as five teams competing in the Sweet Sixteen. 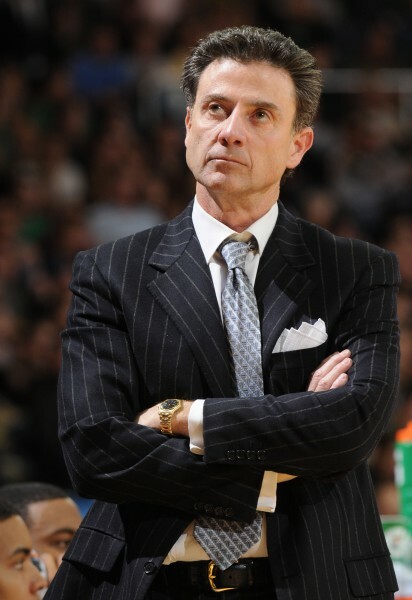 “This league, with the top five teams that we have, that are all NCAA Tournament teams, and really,” said Calipari. “I’ll make a prediction, other than us, of those five, I would say four of those, without us, will be Sweet 16 teams. How about that?” It’s not that far-fetched of a prediction. Vanderbilt and Florida have the talent to compete with anybody in the nation, and Alabama and Mississippi State have both proven its legitimacy within the top 25 teams in the country. And of course, Kentucky, which Calipari didn’t put as a Sweet 16 team, will be competing well into March and most likely early April. Billy Donovan wasn’t happy with Florida’s defense in its loss against Tennessee, but the Gators played with much more intensity in their win Tuesday night over the Georgia Bulldogs. With all eyes on the defensive end, Florida held the Dogs to just 36.4 percent shooting on the night. Donovan was satisfied this time around. “I thought we defended them very, very well,” Donovan said. “We held them to 48 points. I think if you hold any team to 48 points you’ve done a pretty good job defensively.” The Gators, however, continued to neglect Patric Young in the post, as Young attempted just five shots on the night. If Florida can continue to hold opponents to 48 points, the lack of a post game may be a moot point. Mississippi State’s big man Renardo Sidney didn’t start on Saturday for the Bulldogs because of a coach’s decision. “I wanted to save him some foul trouble,” head coach Rick Stansbury said. “He had two fouls early in all those games.” The strategy wasn’t very effective as Sidney still committed three fouls in the first half. The fast paced action perpetuated by Arkansas’ full court pressure limited Sidney’s effectiveness. He scored just six points and four rebounds in 22 minutes of play. His replacement in the starting lineup, Wendell Lewis had similar issues. Lewis was limited to two points in 14 minutes of action. To preview the match-ups in the Big East/SEC Challenge, the RTC Big East & SEC Microsites are facing off in conversational analysis. Brian Joyce and Michael Lemaire take on Auburn vs. Seton Hall and Louisville vs. Vanderbilt. Vanderbilt and Louisville will feature two top 25 teams facing off in the KFC Yum! Center. Mike: The matchup has all the makings of a classic offense v. defense battle. Even without senior center Festus Ezeli, the Commodores are a prolific scoring team (#23 in adjusted offense) and swingmen John Jenkins (20.2 PPG) and Jeffery Taylor (15.4 PPG) can fill it up in a hurry. Of course they haven’t played a team as talented as Louisville. Even with the injuries to Wayne Blackshear, Mike Marra, Stephan Van Treese, and Rakeem Buckles, the Cardinals are still undefeated and the main reason why is they play suffocating defense (#3 in adjusted defense). However, with apologies to Butler, Louisville has played a relatively easy opening slate, and their depth will be tested against Vanderbilt’s talented lineup. Offensively the Cardinals don’t have a go-to scorer per se, but they do have seven players who average at least seven points per game, led by sweet-shooting forward Kyle Kuric (12.5 PPG). They also have a rugged, albeit thin, frontcourt which is led by talented freshman Chase Behanan (9.8 PPG, 8.7 RPG) and center Gorgui Dieng (8.3 PPG, 8.2 RPG) who has been one of the best shotblockers in the country thus far and is a big reason why Louisville is so successful on defense. But as balanced as Rick Pitino’s club is, star guard Peyton Siva is still what makes the team go, and he hasn’t quite found his comfort zone yet, missing two games with an ankle injury. Siva had 11 points, five assists and five steals in the team’s last game, a win over Long Beach State, but he also turned the ball over six times. No matter how good Louisville’s defense might be, Siva and fellow guard Chris Smith cannot be careless with the ball, because Vanderbilt is too efficient on offense to be gifted with so many extra possessions. What do you think, Brian? Brian: I agree that this should be a great one. I think Vanderbilt will really be tested in this matchup. The Commodores haven’t taken good care of the basketball, and Louisville is a team that uses a full court press and creates lots of turnovers. Brad Tinsley has struggled when pressured, and it will be interesting to see how he responds to the Cardinals’ defense. You pointed out Vandy’s efficient offense, but you were nice by not mentioning its struggling defense. The ‘Dores have struggled to cut off opponent’s three-point shot allowing three teams to shoot at least 40 percent from outside the arc so far this year. Louisville loves to shoot the three, so it could be a long night for coach Kevin Stallings if his team lets the Cardinals get hot. It will be interesting to see how Stallings handles the defensive assignment for Siva. 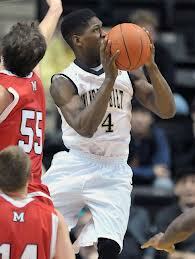 Siva is a player who could really hurt Vanderbilt with his penetration. He can score, as you point out, and he can also find open teammates. And one of the teammates he may find in this one is Dieng. Dieng is still developing his offensive skills, but his 6’11” frame could be difficult for Vanderbilt’s post players to defend. 6’9″ Steve Tchiengang and 6’8″ Lance Goulbourne will be down low for Vandy, but they will have to box out better than they did against Xavier when the Musketeers grabbed 25 offensive rebounds. 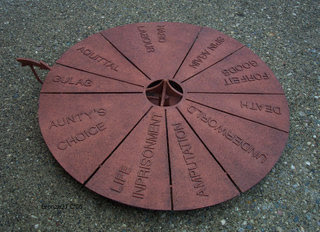 Festus Ezeli busted a deal and spun the wheel. (He also spun his MCL; he’ll be out for a while.) Vanderbilt has been spun about without him, though it might not be due to his absence. 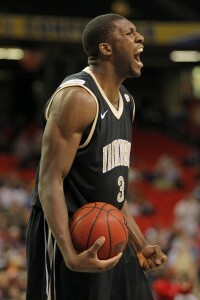 At the beginning of the season, it was theorized that Vandy’s seniors would rise up and contribute more with Ezeli out. Against Xavier tonight, the Commodores of Musictown still couldn’t barter themselves a decent offense. Senior forward Lance Goulbourne (18 points on 8-17 FG seven rebounds), junior guard John Jenkins (20 points on 8-18 FG & 4-9 3FG) and senior forward Jeffery Taylor (18 points on 6-11 FG, five rebounds) all led the charge defensively but faded as near the end. Not one Commodore scored a single point in the last 3:56 of the second half. Earlier in the that half, senior guard Brad Tinsley had controlled drives into the paint that resulted in easy assists. Like the rest of the ‘Dores, Tinsley tried to do too much late in the game. With his limited defensive ability, Xavier guards Tu Holloway and Mark Lyons finally took control and powered the Musketeers to a 82-70 overtime victory. The quality of games kicks into high gear this week with a pair of good ones to start it off. Louisville’s depth has taken a big hit recently with Wayne Blackshear, Mike Marra, and Peyton Siva all dealing with injuries. Siva returned from a sprained ankle Friday against Ohio in a closer than expected Cardinals win but he remains in a shooting slump. He is just 5-24 (20.8%) in three games this season but is managing to dish out six assists per contest. The Cardinals are winning games defensively as they are ranked second in the nation in defensive efficiency while only putting up 67 PPG on the other end of the floor. A Long Beach State team that plays quick without much defense could be the recipe Louisville needs to gain more confidence offensively. However, Louisville must avoid turnovers against the 49ers, a team that loves to get out in transition. The Cardinals are averaging 15 turnovers per game with Siva at a shaky 3.7 per game. Long Beach State has lost twice on the road since winning at Pittsburgh, falling to San Diego State and Montana. The 49ers defense has not been up to par and that is hurting them significantly. They love to play at a fast pace but they are very average defensively as well as on the boards. Casper Ware going up against Siva should be a terrific match-up and he will need to carry the team all night as he did against Pittsburgh on November 16. Long Beach State is not going to get many opportunities to score against the strong Louisville defense so limiting turnovers, especially on the road, has to be its top priority. They average 15 a game but simply cannot afford that many in this game. To win, Long Beach State must play its best defensive game to date and get to the free throw line where they will have a significant edge over Louisville. Depth has to be a concern for Dan Monson, whose team only goes seven deep. Larry Anderson and James Ennis have a height advantage at the two and three positions against Chris Smith and Kyle Kuric, but they must stay in front of their men all game. Ennis is a good on-ball defender averaging 2.3 steals per game, but the Louisville guards may be able to exploit Long Beach State from the three-point arc. In the paint, T.J. Robinson is a terrific rebounder but he will be going up against the 6’10” Gorgui Dieng (3.4 blocks per game) and a Louisville team that rebounds well as a unit. 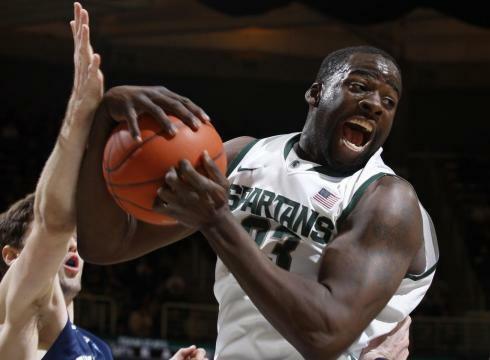 To earn more possessions for his team, Robinson likely has to have a big game on the glass as well as offensively. That will be extremely difficult against a Cardinals front line that allows only 33.5% shooting inside the arc. Long Beach State does have a chance to win the game but there is one major difference between Pittsburgh and Louisville. It is defense and that is why we feel the Cardinals have the ultimate edge in this game tonight. Vanderbilt’s hopes to challenge for a high NCAA Tournament seed have become a little more complicated. 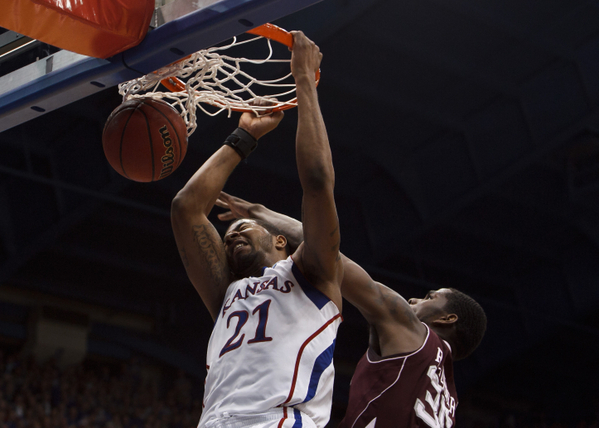 Senior center Festus Ezeli sprained the MCL and PCL ligaments in his right knee during Tuesday’s practice. Luckily for the preseason All-SEC Second-Teamer, the injury does not require surgery and he should return within six to eight weeks. We Hear Ya, Big Man. Get Better Soon. Senior forward Steve Tchiengang will likely replace Ezeli as the starting center. Redshirt freshman Josh Henderson was already planning to see more action due to Ezeli’s NCAA-mandated six-game suspension for ineligible benefits. Now Tchingang and Henderson will need to extend their roles through nearly every significant non-conference game for the Commodores: November 21 vs. either Texas or Oregon State in the TicketCity Legends Classic Finals; November 28 vs. Xavier featuring the recently reinstated 7-footer Kenny Frease; and December 2 at Louisville where Ezeli was expected to be productive against Cardinal centers Gorgui Dieng and Stephan Van Treese.